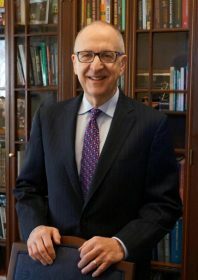 David J. Skorton, 13th Secretary of the Smithsonian Institution (image via Wikimedia Commons). The Smithsonian Institute has survived for more than 172 years, but the government shutdown may be one of its biggest challenges yet. For more than 20 days, the world’s largest education and research complex has been closed to the thousands of people who normally visit its 19 museums each week. According to him, every day of closure prevents approximately 45,000 people from engaging with the Smithsonian. The shutdown has furloughed salaries for more than 4,000 employees, but many of the organization’s contracted workers will not receive backpay. “Each day of the shutdown has palpable effects on this proud and venerable cultural institution,” Skorton says. The secretary, who has announced his intention to resign from the Smithsonian in June, also details how his organization has lost more than $3 million in revenues over the last three weeks. The DC-headquartered organization boasts a $1.4 billion annual budget from an amalgam of federal support, philanthropy, and retail operations. Unfortunately, the shutdown has shuttered the institute’s biggest moneymakers: restaurants, shops, and IMAX theaters.